Sarah Norris, in a Craigville Beach parking lot, said she thought smoking was “frowned upon,” rather than prohibited. DENNIS — Mike Kelly could not have asked for a more beach-perfect day Friday, with a blazing sun and waves lapping quietly at the shore of Cape Cod Bay. But as he relaxed with his family under a blue umbrella, there was one pleasure the 63-year-old Bostonian knew he could not indulge here on Corporation Beach — lighting a cigarette. The town of Dennis banned smoking on the beach last year, joining a growing number of Cape Cod towns fed up with fumes and litter. The most recent to prohibit puffing on the strand was Truro, which this year became the eighth of the Cape’s 15 towns to ban smoking at town beaches. 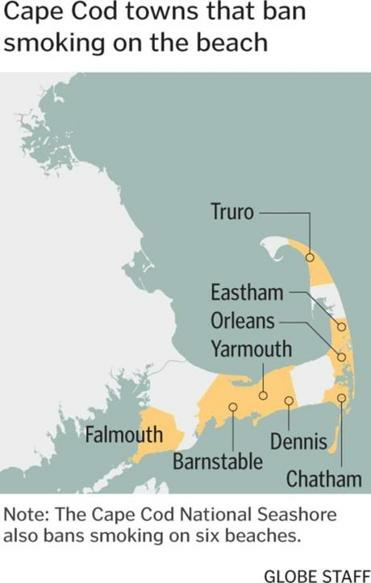 And the Cape Cod National Seashore, which occupies a wide swath of the Cape’s ocean-facing forearm, outlawed smoking at six beaches last year. For town leaders in Dennis, the decision was “a no-brainer,” said Dustin Pineau, beach and recreation director. The Board of Selectmen needed little discussion before voting to ban smoking on the town’s 19 beaches, he said. “It’s good that society is moving in the right direction,” Pineau said. When the Dennis ban first went into effect, smokers “were always cooperative. I didn’t have any arguments.” It helps, he said, that many nonsmoking beachgoers are happy to educate smokers about the new rule. As smokers get banned from bars, beaches, and perhaps apartment buildings, I cannot in good conscience condemn them. 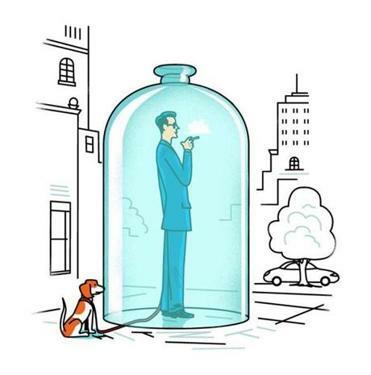 Outdoor smoking bans are a vast new frontier for antismoking advocates, who have already won battles to banish cigarettes and cigars from restaurants, offices, and other indoor locations. More than 40 Massachusetts cities and towns, including Boston, ban smoking in parks and playgrounds, according to the Massachusetts Municipal Association. Americans for Nonsmokers’ Rights , a national organization based in California, lists hundreds of municipalities across the country that have prohibited smoking in outdoor spaces, including more than 200 with smoke-free beaches. In 2009, Maine banned smoking in all state parks and historic sites, including numerous beaches. In Massachusetts, the trend of prohibiting smoking on beaches started, oddly enough, in an inland community. In 1995, Sharon enacted the state’s first beach smoking ban at its three lake beaches. 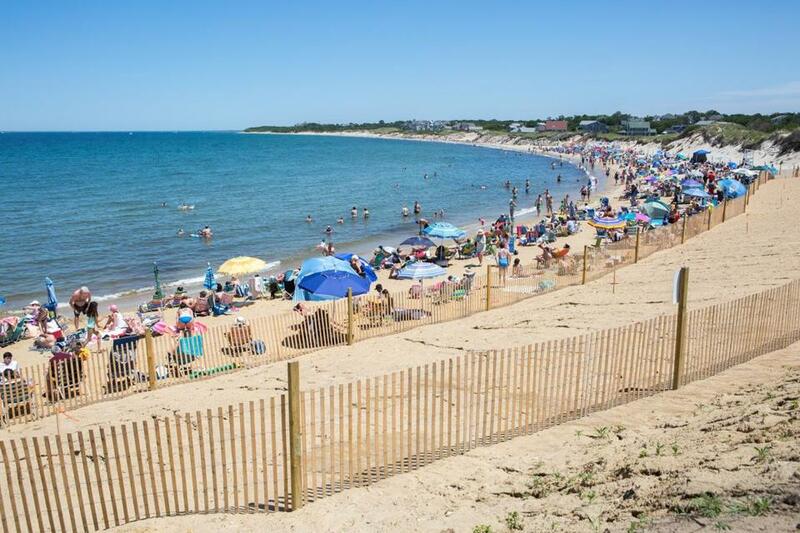 Today, the municipal association lists nearly four dozen Massachusetts towns with beach smoking bans, most located far from the ocean. The harms of secondhand smoke indoors are well-documented. Less is known about the health effects of tobacco smoke wafting through a park or across the sand. But for proponents of outdoor bans, health is only one concern; they are also motivated by the smell and the cigarette butts and packaging left on the sand. “When you’re sitting at the beach relaxing, who wants smoke in your face?” said Bill Boulet, a Floridian vacationing on the Cape this week. 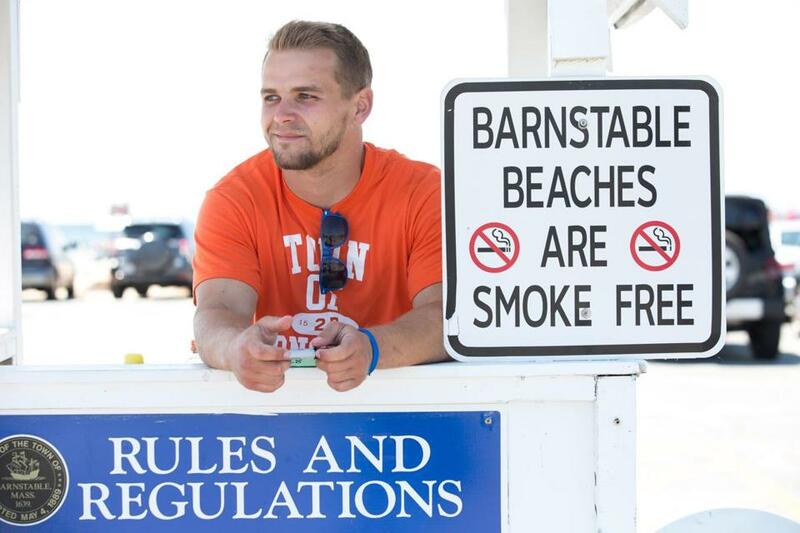 He and his wife, Ruth, were enjoying the smoke-free air Friday at Craigville Beach in Barnstable — one of the first Cape towns to ban beach smoking. It was kids digging in the sand several years ago that led to Barnstable’s ban. Their shovels were employed for study rather than play: A group of middle-schoolers sifted buckets of sand and tallied the cigarette butts, over two seasons, according to the town’s longtime beach director, Patti Machado. The youngsters found that the butts accumulate year after year and never go away; beach rakes do not snare them. Signs at Craigville Beach, where gate attendant Sam Holway worked on Friday, inform beachgoers about the smoking ban. After hearing about that, Machado said, the town Recreation Commission decided to ban smoking at beaches, starting in 2009. “We’ve had no issues. People are very respectful,” Machado said, noting that she has a much harder time enforcing rules prohibiting alcohol and ball-playing. “People should be entitled to make their own choices,” Norris said, finishing her cigarette as she walked to the beach with her 3-year-old. The National Seashore instituted its ban after hearing complaints about smoke on the crowded beaches, said park Superintendent George E. Price Jr. The prohibition applies only to the sections that have lifeguards at six popular beaches. Smokers need merely walk down the beach beyond the guarded areas if they want to light up. “It actually worked out very well,” Price said. The park, which sees 4 million to 5 million visitors each year, has received few complaints and most smokers comply, he said. Only one $50 ticket for a smoking violation was issued last summer, according to chief ranger Leslie Reynolds. Still, not every Cape town is eager to jump onto the smoke-free bandwagon. Officials in Sandwich outlawed smoking in restaurants years ago, but the battle was so bruising that the topic of smoking bans has not been raised since, said the town’s health agent, David B. Mason. Kristen Clark, 48, a Sandwich resident enjoying Town Neck Beach on Friday, said she was torn when asked if she would favor a smoking ban. “I believe in personal freedom,” she said, but she’s also concerned about health. She suggested that smoking areas be designated on the beach. The other Cape towns that continue to allow beach smoking are Bourne, Brewster, Harwich, Mashpee, Provincetown, and Wellfleet. But Provincetown has little in the way of town beaches, with much of its shoreline encompassed by the National Seashore.